We were well pleased to see this infographic show up today. Richard over at Cyclelicio.us let us know about it. He got it via Karl over at Jaunty Angle. 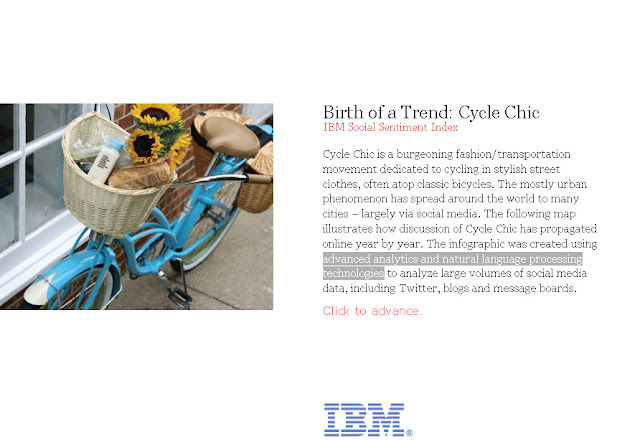 IBM - of all companies - decided to track Cycle Chic in this short history, as a part of their Smarter Planet marketing intiative "Birth of a Trend". Click on the graphic where it says to, in order to go to the next slide. We knew all this, of course. We're doing it almost every day and our Cycle Chic Republic continues to grow. Tomorrow we're leaving for Budapest for the annual Cycle Chic Blogger's Conference (where we'll host a massive Cycle Chic Breakfast for the Citizen Cyclists of the city, as well as a Fashion Show on Saturday) and Cycle Chic continues to blossom. 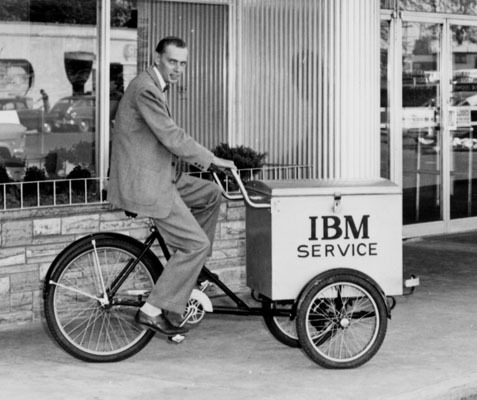 Dapper IBM Repairman in the 1950s on his Worksman Cargo Bike. Everywhere - and I seriously mean everywhere - that I travel to speak about urban cycling, designing cities for bicycles and all manner of conferences and events I invariably meet people who come up to say hello and to thank us for the blog. As a rule, it is women who do so, which is fantastic. The one person I remember best was a young woman in Brazil who, after one of my keynotes, came up to say that Cycle Chic was the reason she bought a bicycle and now cycles in her city. It choked me up. As do our testimonials every time I read them. IBM has their methods and it's great to see the tech side of the evolution. We also have a list of press mentions which also serves as a timeline evolution of the movement/brand. Scroll to the bottom for the first mention of Cycle Chic, in a Copenhagen magazine, and then scroll up to see how it grew and continues to grow. Worth mentioning that last year we started losing track of the press mentions so 2011 and 2012 are thinner, but that's because it went really crazy. Who knows where Cycle Chic will end up. The ultimate goal is that it no longer needs to exist because cycling has been reestablished on the urban landscape as transport and is normalised like it is in Copenhagen and the Netherlands. We're not there yet but we're working on it. Inspiring women to ride - the majority of readers has always been women here (and over half of the bloggers in our Republic are women) as well as on the Facebook group - and men as well. We love our jobs and all of you who are inspired by this blog are inspiring to us. You define us in so many ways. Thank you for cycling. On behalf of all of us who have been active on this blog; Me, Mary, Lars, Marie, Franz-Michael, Andreas, et al. Just wondering, when did you change the name from Copenagen Girls on Bikes and then (if I remember righty) Cycleliciousness to Copenhagen Cycle Chic? The first name was suggested by a female friend of mine but then I coined Cycle Chic. Cycleliciousness was the original name of Copenhagenize, before I coined that, too. Elovelo... at the beginning I took photos on my way from A to B, which meant there were many photos from my POV on the bike of the people ahead of me. As the blog grew in popularity, I started to hop off the bike and take photos 360 degrees.